The NESCO food dehydrator company have been making food dehydrators for over thirty years and their patented food dehydrators feature technology that dries your food faster and evenly. According to NESCO® , you get even-drying from top to bottom due to NESCO's Converge-A-Flow® air-flow design. This is supposed to eliminate the tray rotation, but I still rotate the trays anyway. They also have clear NESCO® food dehydrator trays so you can see what's drying. They also have a Snackmaster® Square Dehydrator and Jerky Maker. 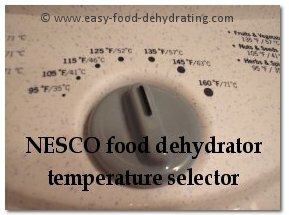 The NESCO® food dehydrator models have a temperature selector which is located on the lid and is easy to read and use. There isn't an on/off switch on the NESCO® food dehydrator, you just have to plug the dehydrator in, and unplug it when you're done. You can buy a 'timer-switch' from hardware stores IF you want to have the luxury of the NESCO® food dehydrator turning off, say after ten hours, if you know you won't be home to shut it off! A neat feature of these NESCO® dehydrators is that you can stack as many trays as you want, within reason! (You MUST have a minimum of four in use, at any one time; see additional comments coming up). I feel good about being able to use as many dehydrator trays as needed, rather than having to run the machine with empty trays ... Sometimes I'll have just four trays going, and some days seven! I began with the NESCO® four-tray model, and purchased additional trays, they come in sets of two at a very reasonable price. I was pleased to see that the new NESCO food dehydrator trays color-matched perfectly with the old(er) trays for an almost seamless stacking experience! Use A Minimum of 4 Trays! NOTE: NESCO® states you must use a minimum of four trays whether you've got food on all four trays or not, for the fan to create even-drying. The only time I ever need to run the dehydrator with less than four trays is when I make fruit roll ups – I only have two Fruit Roll Sheets that came with the dehydrator so only two trays are actually being used! So I bought two more sheets, but I'm leaving in the following paragraph for those of you who still are operating your NESCO food dehydrators with two roll up sheets. 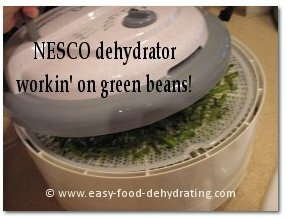 Keep on scrollin' to read more about screens to keep your Nesco food dehydrator clean! The above images and/or links are Amazon ads, and as such, should you purchase an item by clicking on it, a cookie may be placed on your computer and Easy Food Dehydrating may receive a small commission from your purchase. The price you pay doesn't increase. So for now, when only using TWO trays for the roll ups until you have purchased more fruit roll sheets to make the stack of trays add up to four, add an empty tray (without clean-a-Screens, more on those coming up) in-between the fruit roll trays and one more on top, so that you have the 'four tray minimum' for drying. 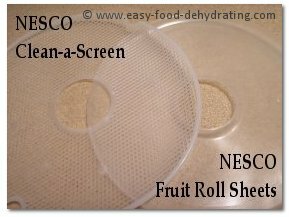 NESCO® dehydrators also have "Clean-a-Screens" which are circular plastic mesh flexible screens. They have little half-round cutouts for your fingers to enable easy removal of the sheets – and that's great! Also, any sticky fruits/foods clean off really easily from these dehydrator screens – which is their intended purpose. I just soak mine in the sink, then gently scrub away any stubborn particles, but honestly, it's rare that I have to put that much elbow-grease into cleaning them. My 4-tray model came complete with two Fruit Roll Sheets as mentioned above, and these are like the Clean-a-Screens inasmuch as they fit neatly into the trays, but these are solid so that the tray's contents CAN'T spill or seep through! Important when pouring puréed fruits to make the fruit roll-ups! The NESCO® dehydrator company also offer cookbooks and Jerky Gun Kits. NOTE: Some of you have written in saying that you've been using plastic wrap instead of the NESCO® Fruit Roll sheets – word of caution here! Make SURE you DO NOT cover the center hole on the trays – if you do, you won't get ANY air circulation and you'll likely burn the motor/thermostat out if you do forget ... so, really I'd err on the safe side and get more Fruit Roll Sheets, they're not at all expensive, as I type this they're around six bucks for two. 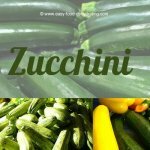 If you want to check out dehydrator reviews before getting one, then please visit Dehydratorjudge.com for in-depth "Best Food Dehydrator" reviews. Also read a more about the history of dehydrating food on their website here. Do you already have a NESCO® food dehydrator? Simply use our easy-to-fill-in-form, directly below, to leave YOUR review for all to see, AND you'll have your very own web-page on this website auto-magically! What Do You Like about your NESCO Dehydrator? Do you have a comment you need to share with us about your NESCO dehydrator? Simply fill out the form, and leave your review. List your likes (and dislikes) -- it will be helpful to our readers! Share your review ... Just type it here! ... Please don't use all caps or any HTML as SBI strips it out. But don't worry, I'll make it look pretty for you! Ancient - But Still Works!